This years’ Kinson Christmas Fair was a big success. The air may have been chilly but the warm Christmas spirit, hot coffees and doughnuts all kept us going! The children got to meet Father Christmas and enjoy some early Christmas gifts. Local business brought over their jams, jewellery, fudge and other local produce. Other local charities such as Breast Cancer Awareness and the Dorset Wildlife Trust joined us on the green and the community all had a wonderful time. People in the community were asking about our services and volunteer opportunities. We were also providing information about how people can leave a gift in their will to Citizens Advice Bournemouth. Not only that, we had Roland from Pension Wise there, making appointments for people to discuss their pension options. 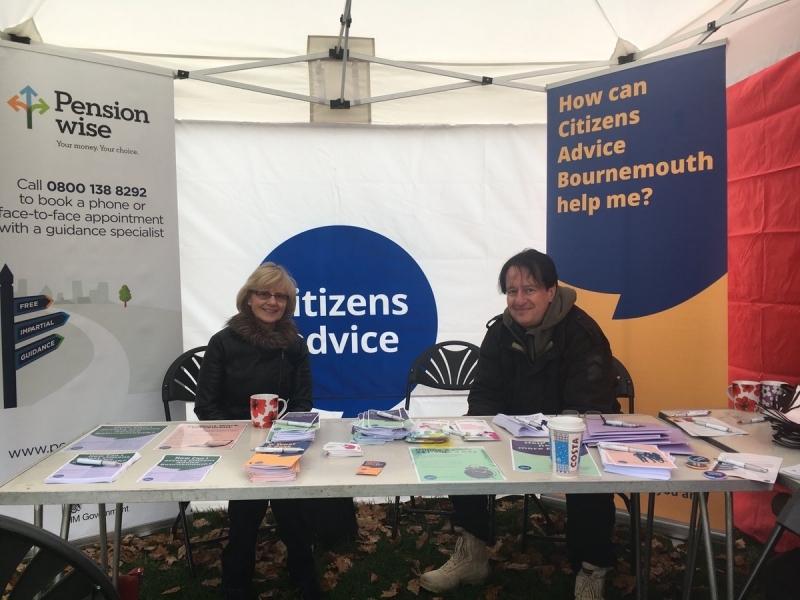 Connecting with the public is very important to Citizens Advice Bournemouth so we can let as many people know about the help we provide in areas such as debt and money, consumer, law and rights, tax, discrimination, housing, benefits, and work. As a charity, our services to the public come free of charge. We rely heavily on donations from the public and funding from associated agencies to campaign on issues of public importance as well as providing the one-to-one help that people might not otherwise have access to. Our Advice Line is available 10am-3:30pm Monday to Friday on 03444 111 444 or you can drop-in to see an advisor in The West Wing at Town Hall Monday to Friday 10am-2:30pm. For a Pension Wise appointment, you can call 0800 138 8292 Monday to Friday 9:45-3:30pm.